On the 2nd December 2016 the Bishop of Gloucester, the Rt Revd Rachel Treweek, spoke in the debate led by the Archbishop of Canterbury on shared values and their role in shaping public policies. She highlighted the compassionate hospitality which this country has shown generations of refugees alongside the work she is undertaking in Gloucestershire to build community, standing ‘with’ rather than ‘othering’ people to promote human flourishing. The Lord Bishop of Gloucester: My Lords, I thank my noble friend the most reverend Primate the Archbishop of Canterbury on his foresight in tabling this debate on shared values. I also add my own congratulations to the noble Lord, Lord McInnes of Kilwinning, and the noble Baroness, Lady Bertin, on their poignant and insightful maiden speeches. “I have come that they may have life, and have it to the full”. On 2 December 2016 the Archbishop of Canterbury, the Most Revd and Rt Hon Justin Welby, led a debate in the House of Lords “That this House takes note of the shared values underpinning our national life and their role in shaping public policy priorities.” His opening and closing speeches are below. The Bishops of Ely and Gloucester also spoke in the debate. 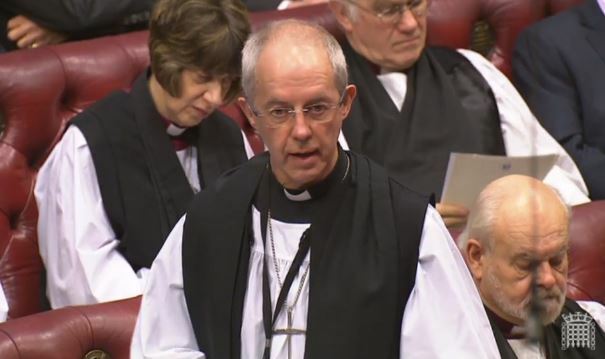 The Archbishop of Canterbury: My Lords, I am most grateful to the usual channels for making this debate possible. I should also like to thank noble Lords who have made the time and taken the trouble to attend today in considerable numbers, the Minister, the noble Lord, Lord Bourne, and those who look after us so well in this House. “The Lord Archbishop of Canterbury to move that this House takes note of the shared values underpinning our national life and their role in shaping public policy priorities”. It will be an especial pleasure to hear maiden speeches from the noble Baroness, Lady Bertin, and the noble Lord, Lord McInnes of Kilwinning. The noble Baroness brings her knowledge of communications, issues of disability among children and education. The noble Lord will enable us to have a wider view of issues in Scotland. The UK, especially perhaps England, is a pragmatic country with a bias towards the empirical over the theoretical. Not for us the cries of “liberty, equality and fraternity”, to be followed by years of bloodshed to ensure true fraternity was established. Rather, ours is an untidiness of cumulative reforms and changes, worked out in practice through the highways and byways of our constitution. We relish the irony of a constitution that works in practice but never could in theory. On the 14th April 2014 the Bishop of Derby, the Rt Revd Alastair Redfern spoke during a debate on the Deloitte report ‘Technology and people: The great job-creating machine published in August.’ Bishop Alastair spoke about the competing pressures of company supply chains and corporate responsibility, the values of society and the impact technology is having as efficiency cuts across the face-to-face pastoral engagement of professions such as healthcare. The Minister Baroness Neville-Rolfe responded for the Government and addressed a number of the questions highlighted by the Bishop. The Lord Bishop of Derby: My Lords, I, too, thank the noble Lord, Lord McFall, for his analysis, not least his observation that growth is not the answer and the unintended consequences of marketisation, as he called it. I probably want to explore what he might have meant by “the social, stupid”—there is an important clue in that. On the 14th May 2013 the Bishop of Winchester, the Rt Revd Tim Dakin gave his maiden speech in the House of Lords. Following the convention of the House the Bishop spoke about his diocese and then addressed the debate covering his areas of interest education, social cohesion and agriculture.